Published on August 4, 2018 by Wade Shepard Follow me on Twitter here. I considered buying the new BlackBerry Key2. I put up a blog post about it and asked you what you thought. The concensus? If you need it for your work and your stupid iPhone is really holding you back, then by all means get the new phone. I do everything on my phones. I’m a journalist, I’m an author, I’m a blogger. My entire existence is the process of absorbing experience and information and synthesizing it into content. I’m like a machine, and the smartphone is what drives the engine. For some years I didn’t have much of a problem with my phones. There were no questions: I used BlackBerry Passports, which is probably the oddest mass market phone to ever be made. I loved this piece of machinery and it did the job. Then the BB10 operating system began getting depreciated. Common apps that you take for granted stopped working on them, and these phones became unusable as daily drivers. Around a year ago I bought an iPhone like everybody else and have been complaining about it ever since. It just wasn’t made for what I needed it for. It wasn’t the fault of the technology it was the fault of me trying to use it wrong. iPhones are toys. They are for playing games and watching YouTube; not running a mini empire of sources and setting up and executing travel writing adventures. I need to be able to run multiple programs on my phone and switch between them rapidly and with ease. I need to be able to copy and paste accurately (why are iPhones so horrible at this?) and move my cursor where I want it to go without frustration (I once threw a fit and slammed my iPhone on the floor after not being able to make the f’cking cursor go in the right spot) … and why the f’ck doesn’t iOS have a plain and clear and easy to click button to add attachments to emails??? So it was pretty clear that I was going to drop $650 on the new BlackBerry… but then I stopped myself short. What if I don’t buy a new phone but try to make good with what I have? I had an iPhone … the screen of which I had just fixed myself. I had two BlackBerry Passports — one needing a new battery and the other needing its Sim card slot fixed. Why not just repair them myself and save money? And so when you look at your phone, and this is the portal that a lot of people go through to the world. And the phone is like this beautiful glass case that has weird screws in it, it’s locked up in crypto and you feel that like, well, I love this, my life’s attached to it, but I have no control over it, right? All of a sudden, like you’ve just surrendered so much of your independence to the people who own and run these servers and run the technology. And at the end of day that’s dangerous. I mean, I just think that as a long-term thing for society: you shouldn’t put that much power in the hands of a small group of people. And the way to combat it is education. People should know that like everything in this product that I am holding in my hand is made by people. And it’s all understandable by people. There’s nothing magical about it. You don’t have to be a special kind of human. Like, you’re not a better human because you understand what’s in this box versus not understanding what’s inside this box, right? And so controlling that knowledge is a way to control the privilege to that knowledge, right? And so it actually favors people who are in power to make you feel like, ‘oh this thing is like impenetrable and you can’t get into it.’ They control that knowledge. You have no way to get to that level. The thing that differentiates them is not they’re better humans, they just have the knowledge and you don’t … The people controlling the knowledge of the technology that controls our lives at the end of the day. We can take control of our technology, understand it, open it up, fix it ourselves … or otherwise make it do what we want it to do. So I cracked open the Passport that needed the Sim card slot fixed. The insides were the expected ensemble of circuits positioned around a battery. It seemed surprisingly not complex: for what smartphones do they are rather straight forward devices — clean and clear, like contour lines of a Bauhaus building. 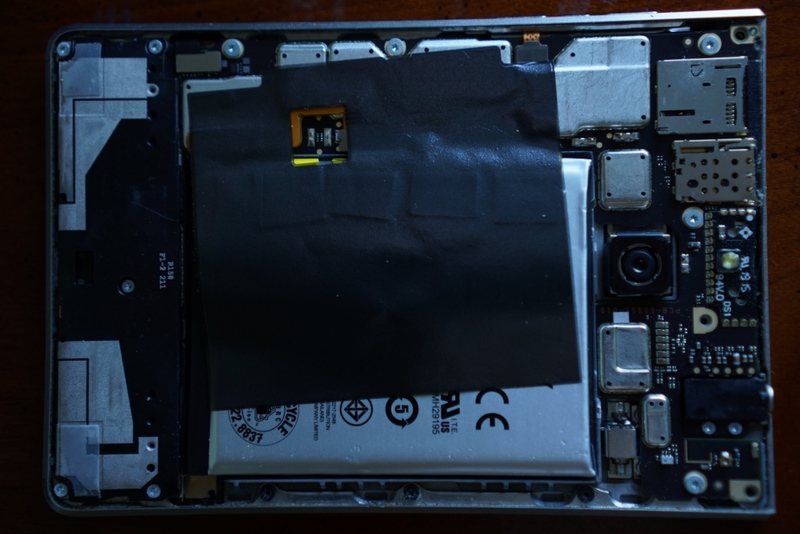 I inspected the Sim card slot, and where I expected it to be bent it was actually broken. A corner disconnected from the mother board. I thought of buying a small soldering gun and fixing it right … but then realized that some little stick on labels that I found in a drawer would do the trick … for a time, anyway. So I stuck a pile of little labels onto the inside of the back cover in just the right spot and then closed up the phone. 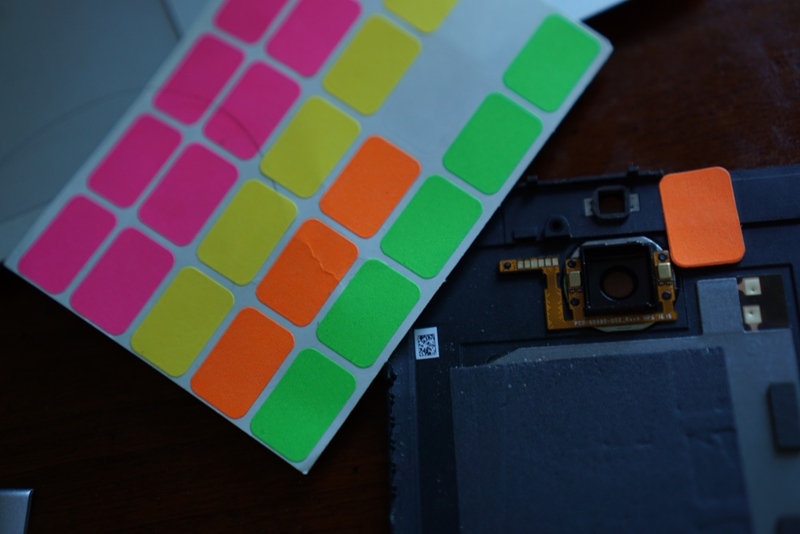 The stack of labels pushed the Sim card slot up against the motherboard, facilitating a connection. I’m now running a two phone setup: an the old BlackBerry that I write blog posts, take notes, do email, read and copy and paste from articles, and make phone calls on and the iPhone where I run all of the apps that no longer work on the BlackBerry. I’m not sure how long this is going to last.